In September 1769, three thousand people descended on Stratford-upon-Avon to celebrate the artistic legacy of the town's most famous son, William Shakespeare. Attendees included the rich and powerful, the fashionable and the curious, eligible ladies and fortune hunters, and a horde of journalists and profiteers. For three days, they paraded through garlanded streets, listened to songs and oratorios, and enjoyed masked balls. It was a unique cultural moment--a coronation elevating Shakespeare to the throne of genius. Except it was a disaster. The poorly planned Jubilee imposed an army of Londoners on a backwater hamlet peopled by hostile and superstitious locals, unable and unwilling to meet their demands. Even nature refused to behave. Rain fell in sheets, flooding tents and dampening fireworks, and threatening to wash the whole town away. 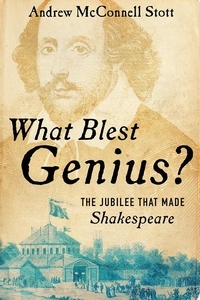 Told from the dual perspectives of David Garrick, who masterminded the Jubilee, and James Boswell, who attended it, What Blest Genius? is rich with humor, gossip, and theatrical intrigue. Recounting the absurd and chaotic glory of those three days in September, Andrew McConnell Stott illuminates the circumstances in which William Shakespeare became a transcendent global icon.